→Surgent CPA Review: High Tech Study Program? Surgent CPA Review: High Tech Study Program? 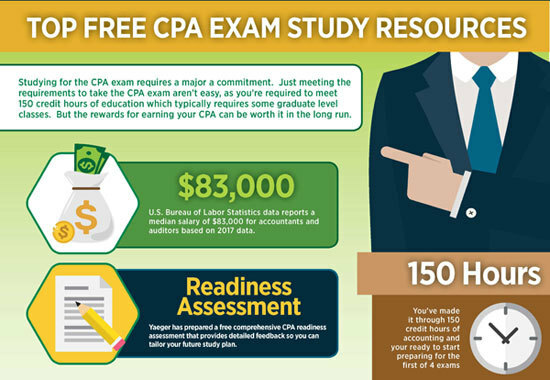 Passing the CPA exam generally requires studying an average of 90 to 100 hours per section. When you already have a full time job this type of time commitment can be really hard to keep. So any opportunity you have to make your studying more efficient and less time intensive can be a major life saver. That’s why we were intrigued when we first learned about Surgent’s algorithmically based platform designed to make your CPA prep more efficient. 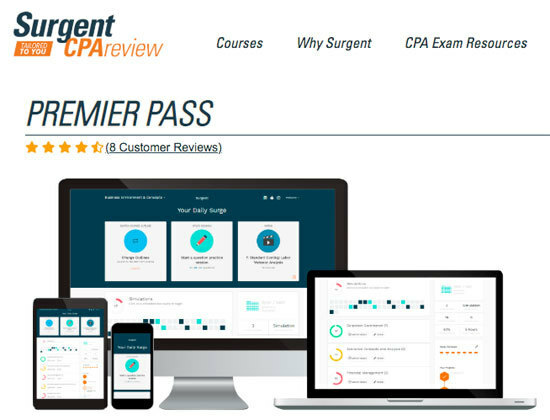 Our full review of Surgent’s CPA prep course includes a detailed overview of the product options and features as well as our first hand experience using the platform. ASAP Technology is Surgent’s proprietary adaptive learning platform. 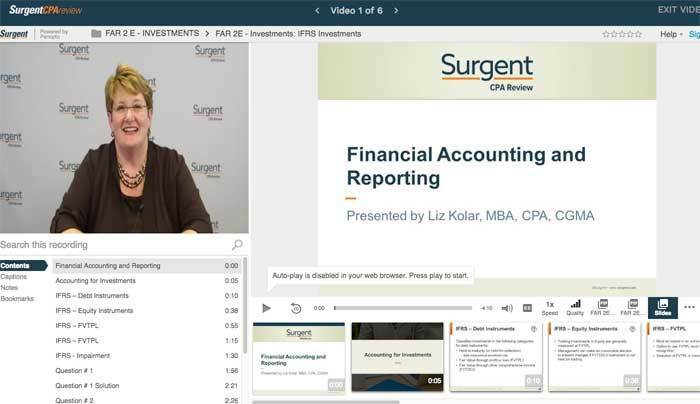 This algorithmically structured platform is the core differentiating aspect of Surgent’s CPA exam study program. Your skill level is assessed on day 1 and then your provided with a highly detailed and personalized study plan to specifically improve your weaker areas. Surgent’s technology then tracks your progress throughout your completion of the study program and continues to adjust your personalized study program in real time based on your relative improvement within each topic area. Traditional CPA courses are structured in a linear fashion. This means that your study plan progresses through a standard set of lecture and text based topics in sequential order according to the material on the CPA exam you plan to take. This is the classical approach to teaching because it covers all topic areas in a standardized fashion for all students. The problem with this approach is that it treats all students equally. The reality is that every student has slightly different strengths and weaknesses within each topic area. If you spend time watching videos and reading text based material in areas you already know well, the net result is that your not learning anything new and your time could have been better spent improving one of your weaknesses. This was precisely the problem Surgent intended to correct when they developed their Adaptive software platform. 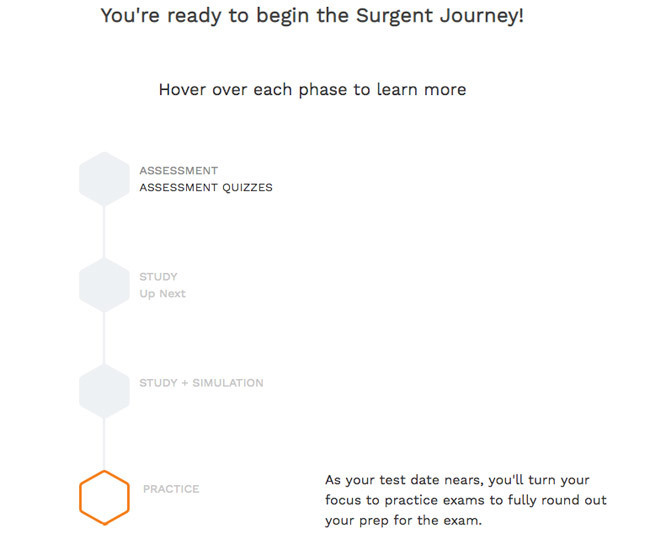 Surgent’s adaptive learning program is segmented into 4 distinct phases: Assessment, Study, Review, and Pass. Step by step process as part of Surgent’s personalized study plan. The first phase is the assessment phase. New students start by completing 10 quizzes across the major topic areas of the CPA exam. Its very important that students take these questions seriously because the answers serve as your baseline for how the software algorithm creates your personalized study program. 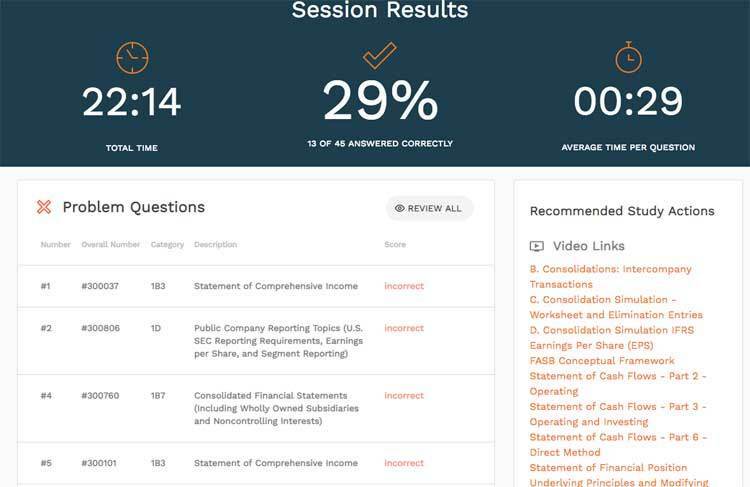 Based on the results of your initial quizzes, Surgent creates a detailed study program linked to the exact date you plan to sit for the CPA exam. The most important element of this study plan is that will constantly evolve along with the changes in your knowledge level. So this program is designed to change and evolve at the same speed of your individual progress over time. Study Planner tool determines how many hours you need to prepare based on your exam date and comfort level with the material. Your study plan is guided by a dashboard that offers videos, quizzes, and text material for each study session. Hyper targeted videos designed to cover the most important elements of a topic without going overboard and drowning you in extra information. The Review phase focuses on accessing your skills with full sized practice exams. Based on your performance, Surgent’s adaptive software will let you know when your ready to take the real exam. As you progress throughout your study program, your skill level will be constantly updated based on your personalized ReadySCORE. This will give you an overall score as well as measure your skill level across individual topic areas. After completing the adaptive learning course you will have a strong sense of your strengths and weaknesses. You will also know instinctively that you are ready to take the exam. Surgent reports that students with a ReadySCORE of at least 75% have an 89.7% pass rate on the CPA exam. Surgent stands by the success of their students when they follow the adaptive learning platform and put in the required study time. For any students that put in the time and effort and do not pass the CPA exam, Surgent offers a full 100% refund to their course or will offer continued free access until the student passes. For more information on the Pass Guarantee, click here to review the full details. Surgent’s flagship program offerings include study material for all 4 sections of the exam and the hyper personalized study program driven by the company’s proprietary algorithm. Each program offers a variety of features designed to appeal to students with a range of learning styles. ASAP adaptive learning software that covers all 4 sections of the CPA exam. Personalized study program designed for your skill level and linked to your exam date. Access on your desktop, tablet, or mobile device. Over 6,000 multiple choice questions. 350 video lectures with custom study notes. Electronic study material available as an ebook. Electronic flashcards available as an app for mobile devices. Unlimited access until you pass. All course features and benefits included in the Essentials course. Printed textbooks for all 4 sections of the exam. Printed flashcards for all 4 sections of the exam. 3 sessions with a CPA Exam Success Coach (each session is 30 minutes). Surgent’s success coaches act as personalized tutors that can help you with anything from study planning or test taking skills to guidance on specific topic areas. All features included in the Essentials and Premier courses. 4 hours of personal online tutoring from an Accounting professor. Access to Surgent’s Excel for Accounting and Finance Professionals course. ASAP adaptive learning software for a specific section of the exam (FAR, AUD, BEC, or REG). Online course accessible on your desktop, tablet, or mobile device. Multiple choice questions range from 1,400 (BEC) to 1,700 (FAR) depending on the exam section. Task based simulation questions range from 70 (BEC) to 110 (FAR). Available video lectures range from 50 (REG) to 120 (FAR) with custom study notes included in each section. Electronic study material included with each section. Section courses are available for $599. Students are greeted with the Daily Surge which is a detailed dashboard highlighting your study plan objectives. The nice thing about Surgent’s course structure is how user friendly the on boarding process is for new students. When you first login to the course, you walk through a simple series of screens that asks you to input your scheduled exam section, the test date, and the days of the week you plan to study. Anytime you take a quiz, Surgent offers detailed information for every question you answered. Upon completion of your profile, your moved directly into your first assessment quiz. Keep in mind that the first quiz includes 45 questions, so make sure you have the time available to dive right into the process. The nice thing about Surgent’s quiz structure is that you receive instant and detailed feedback right after you answer on the right hand side of the screen. This includes a summary explanation and statistics about how many other students answered the question correctly on the first time. If you need additional information on the topic, there are direct links to video lectures and study notes that provide further detail. At the end of your first quiz, you receive a detailed dashboard highlighting your results. At the top of the screen you receive a percentage score, how much time you needed, and an average amount of time spent on each question. Directly below that dashboard there is a list of every incorrect question you answered along with a link to review that specific question. The questions you answered correctly are included below that section with the same optional review link. On the right hand side there is a list of recommended resources for further information about the topic areas you answered incorrectly. 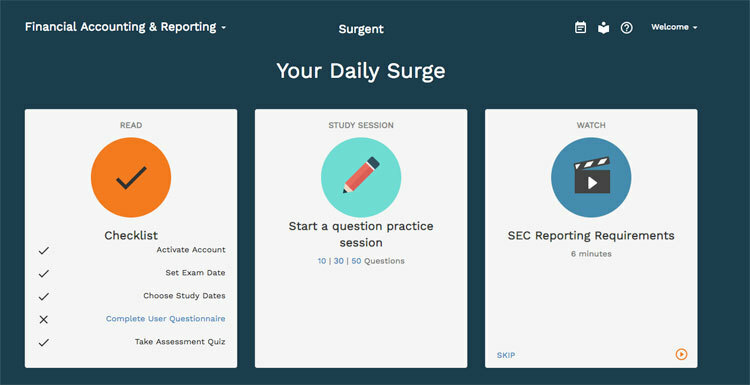 The Daily Surge represents your guided dashboard for each section of your personalized study plan. The daily dashboard will change based on the study plan recommended by your personalized study plan. Directly below the main dashboard is a topical overview of each topic area for the section of the CPA exam that you are studying. The main topic areas are organized based on the percentage weight the topic area is tested on the exam. If you click on the main topic area, a drop down list will show you every sub-topic area within that section. From this point you can choose to review the videos or complete practice questions within that subject area. Its important for students to recognize that you have the choice to follow topic areas based on the order highlighted by the adaptive study plan or you can choose to individually select topic areas and answer questions or watch videos based on your preference. Each answer offers a detailed explanation along with a direct link to for further information about a topic. 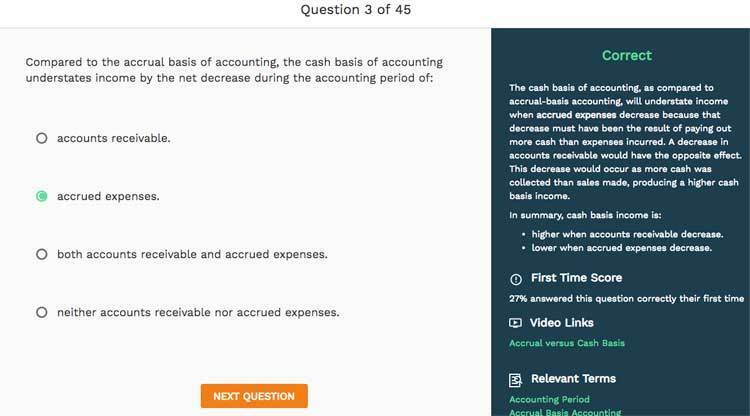 Within the practice question sections, students have the option to drill either multiple choice or task based simulation questions. You can answer questions based on the order outlined in the adaptive learning study plan or you can answer questions by topic areas that you select. Multiple choice practice questions are available in groups of 10, 30, or 50 questions at a time. Surgent’s adaptive learning platform will weight these questions based on your current skill level. So you’ll see more questions in your weaker areas and less questions in your stronger areas. It’s important to keep this in mind because you may find yourself answering harder questions and may initially feel discouraged with your performance. So keep in mind that Surgent’s algorithm is designed to improve your weak areas and not to make you feel better by asking you easy questions. So keep plowing through the quizzes, you will find that over time you will gradually improve as you retain more information. In the long run you will be better off improving your skills in the harder topic areas. Alternatively, you have the option to answer questions based on your selections. You can sort the questions based on the following categories: All questions, least seen, new, trouble questions, or missed questions. The bite sized video lectures offer easy access to all topic areas so you can quickly focus on certain topics. The video lectures follow the same format as the practice questions. You have the option of following your personalized adaptive learning based path or you can individually view videos based on topic areas. The videos are structured to be highly tailored within the topic areas. Rather than focusing on lengthy videos which could require multiple hours of viewing time, the videos are segmented within content areas so you can easily hone in on certain problem areas rather than sitting through a video that covers multiple topics. The video content is also directly linked to problems. So the lectures verbally explain the rational for arriving at the correct answer. On the right side of the screen, you have direct access to pdf notes covering the topic area described in the video. You can view the notes directly on your screen, download them to your home computer, or you can print them out from your printer at home. No CPA exam prep course offers a magic formula to pass the CPA exam. No matter which course you select, you still need to put in the necessary amount of time and effort to master the material. What Surgent can offer students is the opportunity to make your study time more efficient and less time intensive. If the average CPA exam section requires close to 100 hours of study time, being able to reduce that amount by even a small percentage can make a big difference. The main thing to keep in mind is that you need to closely follow the plan laid out by the software algorithm to get the maximum benefit. This includes completing the the initial quizzes at the beginning of the online program to the best of your ability. While it may seem like a lot of questions (450 total questions), the program really can’t develop an accurate assessment of your real strengths and weaknesses without it. But if you follow the program as its laid out, you will be really surprised at how rapidly your progress will improve. In essence, by focusing on your strengths, your not wasting time re-learning things you already know. So it may fee frustrating at first, in the long run your progress will improve at a rapid pace. Surgent’s Pass Guarantee offers students a full refund if they don’t pass the CPA exam. Clean layout that is easy to navigate on both your phone and a full sized desktop. Real time learning adaptive platform that continues to adapt to your changing skill level throughout your progress. Allows students to choose between following the adaptive learning based study plan or you can choose your own sections to focus on outside of the customized study plan. Multiple product options ranging from ranging from individual exam sections to comprehensive full course options. Students that prefer learning in a classroom setting have the option to include the premium accounting professor tutoring option.